I just saw for the second time Evangelion 2.0: You Can (Not) Advance at the BFI Southbank, part of their Anime Weekend. I’ve waited almost a year to see this again — with English subtitles — having made a special trip to see it in Tokyo last year. It blew me away then and it blew me away again the second time around. This is without a doubt one of the best anime films I’ve ever seen and one that certainly rewards repeat viewing. While in Japan, I was lucky enough to catch the second Renewal of Evangelion movie at the Human Trust Cinema in Shibuya, Tokyo. 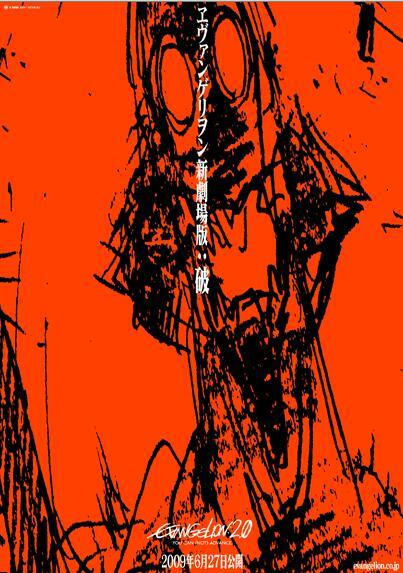 Evangelion Shin Gekijōban: Ha (Renewal of Evangelion: Ha or Evangelion 2.0: You can (not) advance as it is alternately known) is the next in GAINAX’s remakes/reimaginings/cash-in rip-off’s of their popular, controversial anime series. Despite my misgivings about reanimating and redoing an otaku favourite, I was really impressed by the first film (Evangelion 1.0: You are (not) alone). Yes, the story was exactly the same as the first six or so episodes of the series, but it had been a long time since I’d rewatched the TV anime and the newly animated footage was stunning. To see everything rendered in new, 21st Century colours and CG was a treat for the eyes, and the story still holds — in some ways it was even better without the filler fluff that comes with a TV series. Yet, while the story was essentially the same, it did hint at big changes to the original plot — Kaworu, for example, made a few taster appearances. This is carried on in the second film, which while going through essentially the same hoops as the original anime, takes a different route in getting there. Thoughts: There’s only one way to describe Gurren Lagann and that’s simply GAR! It’s enough to make grown men weep with tears. Manly tears, but tears nonetheless. Yep, this is gonna be a rave, so prepare yourself. Who the hell do you think I am?